I was so happy ﻿to have made the Top 5 at Meljens last week that I decided to make this card using the same digi background that I used in that card. This week I decided to serve up some pumpkin pie for everyone to share. 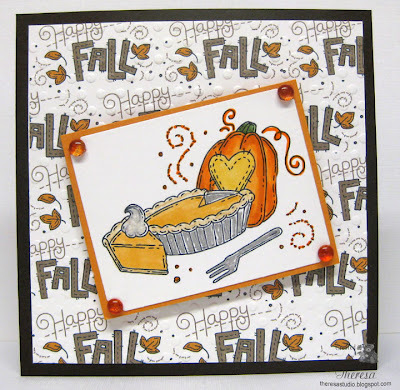 I started with a brown CS base and added a mat of the Happy Fall background that I created with Meljens Design "Happy Fall". Colored the Meljens Design "Pumpkin Pie" Image with Copics and a Silver Metallic pen. Cut with a Nesties Label Die and matted on Orange CS. Added some dew drops for sparkle. Now I am serving it up...have a slice and enjoy your Thanksgiving Day. Meljens Designs: Challenge is Fall. The aroma of fresh Pumpkin Pie says fall to me. 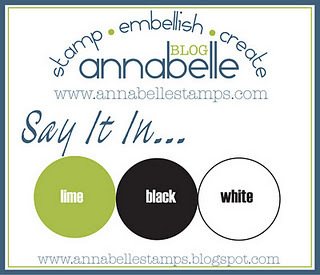 The challenge this week at Annabelle Stamps Blog is Say It With ...Buttons and Bows. I made a simple card using her stamp set "Dotted Flowers" . I stamped the stems in Memento Pear Tart ink, the flowers with Memento Rose Bud and SU Sage Shadow, and the sentiment with Rose Bud on White CS and matted the image on a scrap of pink CS. Added the buttons from stash with Annabelle's Green Twine and a bow of Pink Satin. Finished with pink rhinstones for some shine. The base card is a glittery stripe paper from We R Memory Keepers Scrapbook Pad. I was happy to have won the challenge at Annabelle's last week. I enjoy all your comments. Working ahead this week to get some posts scheduled in advance as I will not be able to do so later this week. 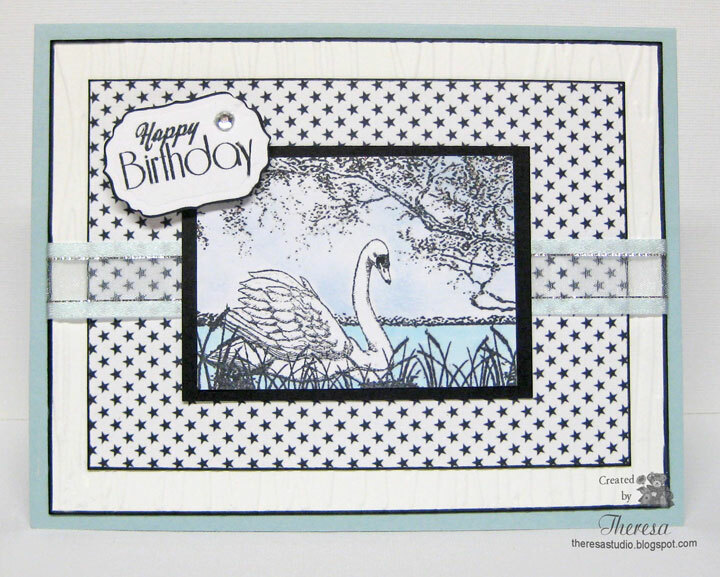 This birthday card was created with Mark's Finest Papers stamp "Floating Along". 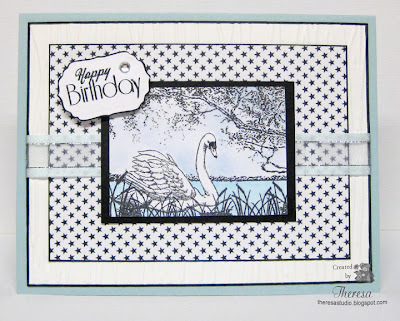 The swan scene was stamped on White CS with Memento Tuxedo Black and blue was added to the water with Copic B000 and to the sky by sponging Memento Summer Sky ink. I matted he image on Black CS and placed onto a mat of Black and White stars digi paper. This was attached to a White Mat embossed with Cuttlebug EF Forest Branches...ties in with the trees ? Added the ribbon of soft blue organza with metallic silver before attaching the base card of Blue CS. 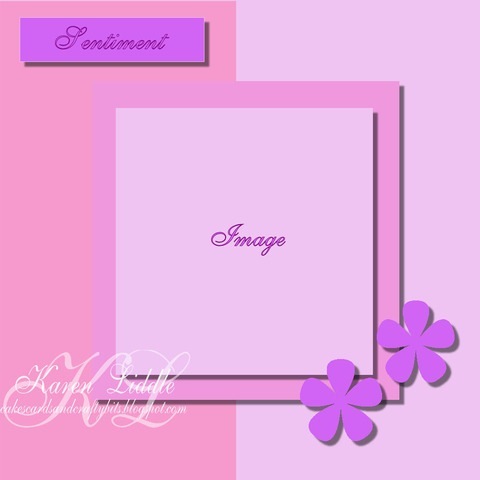 Sentiment was stamped and cut with Labels 4 Die. I outlined the mats of white and pattern papers and the sentiment with a black marker to add the look of mats but with out the weight of layering. Speedy the Cat's Friends Challenge: Use black, white, and one other color of your choice suggested by Harriet Skelly. Do You Stack Up: Use a splash of blue. 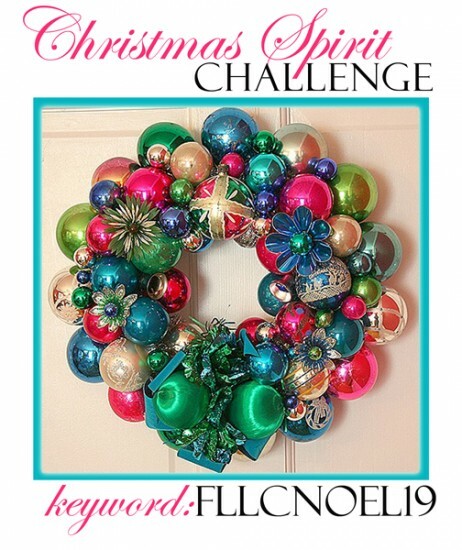 CRAFT Challenge: Challenge is "Stars in your eyes!" One Stop Craft: Create something using blue. Crazy 4 Challenges: Create a card using black & white and only one other WOW color!!! Stamp, Scrap & Doodle: Challenge is embossing. May have to enlarge picture to see. At Flourishes the Timeless Tuesday challenge by Tammy is “Flag, You’re It!” . We are to add a flag to our card in some way or do something with a banner or pennant (a form of a flag). 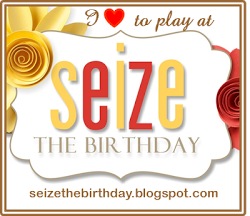 I created my card with a banner and a sentiment pennant on an embossed mat of white card stock with a simple rose. I used stamps from 4 Flourishes sets including A Year in Flowers (set 2), Birthday Pennants, Strips and Stripes, and Paperwhites. It turned out to be a monotone card as I decided not to color the rose. Added pearls to tip of banner and to the sentiment pennant. 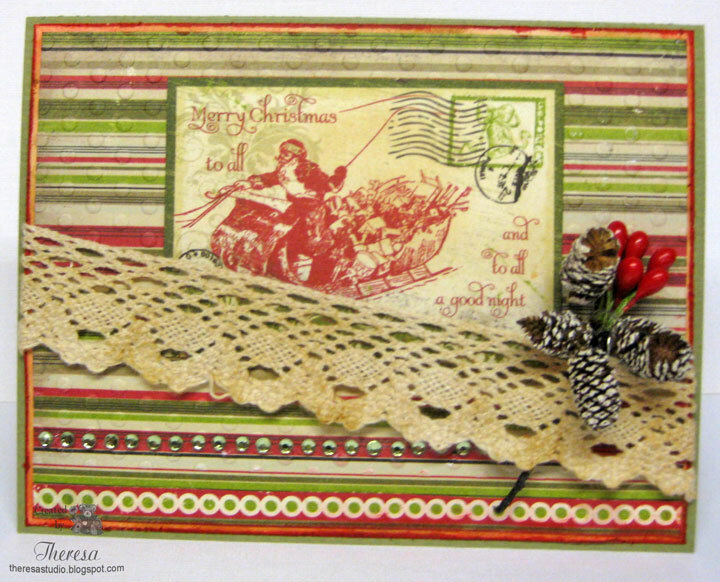 Truly Scrumptious: Christmas Project with vintage or pearls. 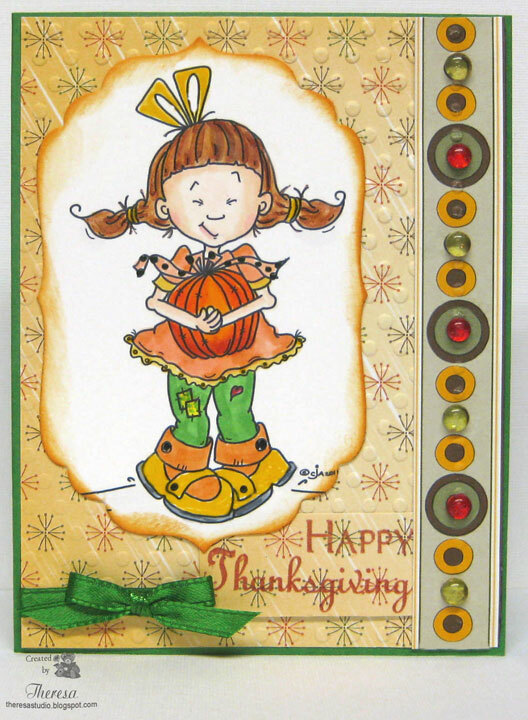 Another card with a Thanksgiving Theme. I used a digital image "Autumn Friends" from Paper Cupcakes. I colored this with Copics and Memento Summer Sky. I cut the image and matted with orange CS. I cut a circle of Blue CS and folded in half to make a "Rocker" card (my name for rhis card) and attached the image to the top of the half circle. 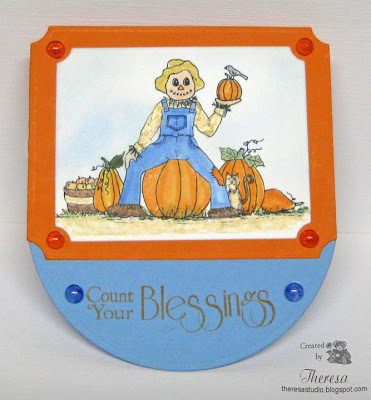 Finished with a sentiment from Mark's Finest Papers stamp "Country Thanksgiving" and some dewdrops. 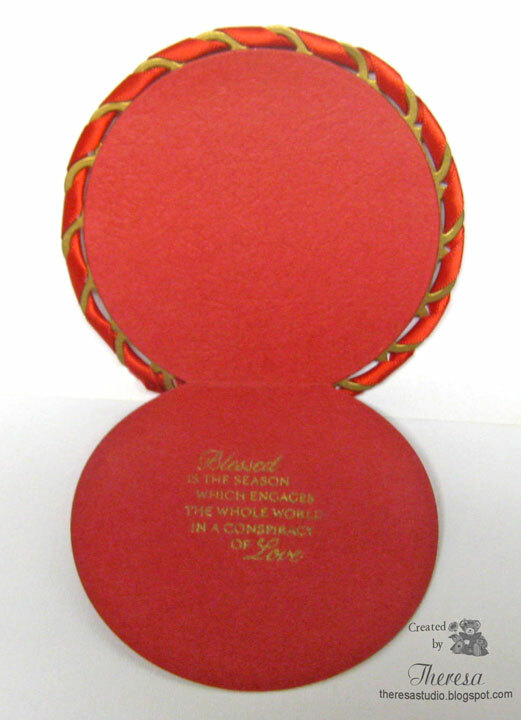 There's Magic in the Air: Use a half circle on card and use orange, brown and blue for the colors. One Stop Craft Challenge: Challenge is to create something using the colour Blue. PaperPlay Challenge: Make a shaped card. Gobble, gobble! Almost Turkey Day! I decided to make a turkey card using Mark's Finest Papers "Give Thanks" stamp set. I stamped the turkey on white CS with Memento Rich Cocoa and colored with Copics which I guess happens to be my fave technique. I used a mat and strips of BasicGrey from Jovial, Max and Whiskers, and Oliver paper pads and threw in some BasicGrey Brads as well. Embossed the dark mat with Cuttlebug EF Polka Dots which has became a fave EF because of its larger size. Stamped the sentiment on a scrap of BasicGrey with Memento Rich Cocoa. I don't think this turkey will be on any dinner table. Speedy the Cat's Friends Challenge: Use your favorite technique. Coloring with Copics is my fave thing when card making. BasicGrey Challenge: Mix n match BasicGrey. Used papers from Jovial, Oliver, and Max and Whiskers with BasicGrey brads. Sentimental Sunday: Challenge is Thanksgiving/Thank You with a sentiment. Let's Ink It Up: Show us your favorite technique. Coloring with Copics. Paper Cutz: Theme is Let's Talk Turkey. This is another vintage card using stripes and spots for the challenge at Sugar Creek Hollow. I used Pattern Papers from Authentique Paper Pad "Wonder" including the Postcard cut from one of the papers. 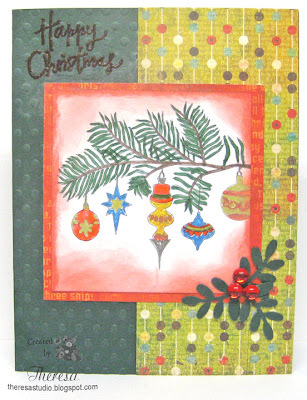 I added some lace, green rhinestones and a sprig of pine cones and berries to complete the card. I did some distressing on the lace and papers with Distress Inks Barn Door, Antique Linen, and Brushed Corduroy. 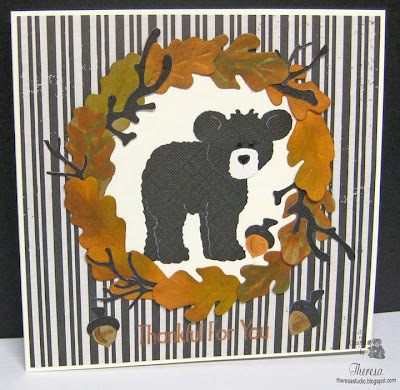 Sugar Creek Hollow: Use both stripes and spots on a vintage, shabby chic or primitive card. Paper Players: Use colors Riding Hood Red, Always Artichoke, and River Rock. All the colors are in the papers. This was a quick card to make since I used a color vintage image of Santa Claus from Paulette's Create with TLC that I downloaded some time ago. I have been wanting to use this image and it goes just great with these papers from Authentique "Wonder" pad and BasicGrey "Jovial" pad. I cut the image with an oval die and placed it on a doily from my stash that I distressed with Wild Honey Distress Ink. Stamped a GKD Sentiment with Versamark and used Ranger White EP. Assembled the card and added MS Pearls, Organza Ribbon Bow, and some plastic sprigs of holly that I just happened to have. 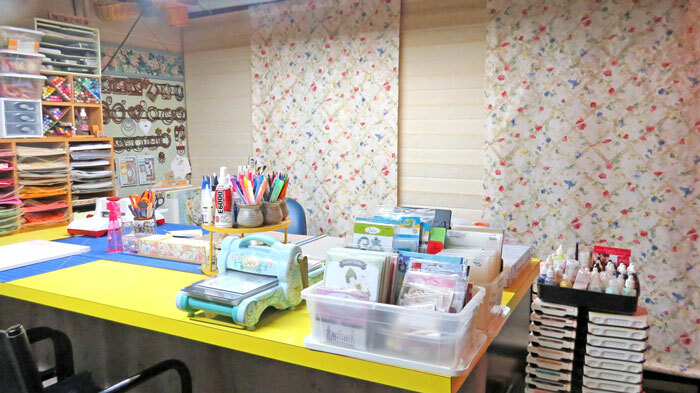 Sugar Creek Hollow: Use both stripes and spots on vintage, shabby chic or primitive card or other paper-crafted project. Stripes are in the border of mixed patterns on left of the card and spots on the mat under the doily. Saturday Challenge Secret Crafters: Theme is Spot and Stripes. 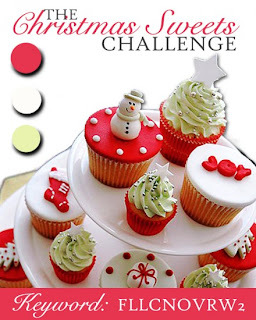 Really Reasonable Ribbon: Challenge #36 is CAS (Clean & Simple) Christmas plus Ribbon. This was a very simple card to make. Tuesday Throwdown: Challenge #75 is lots of circles. Lots of circles in the Paper and Doily. 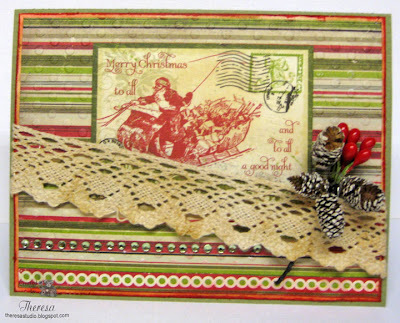 Truly Scrumptious: Christmas projects with pearls or vintage. Mine has both. Even though this was a easy project, I really like the vintage look and richness of the colors. 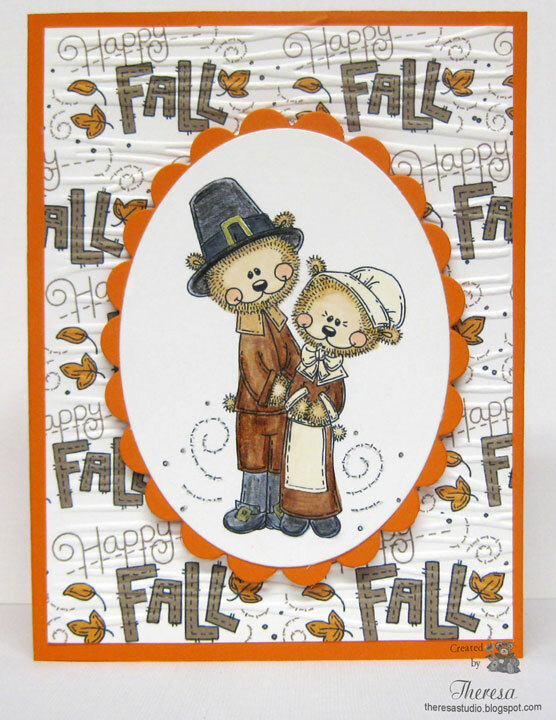 What better way to celebrate Fall and Thanksgiving than with a card made with Meljens' "Teddy Bear Pilgrims" and her "Happy Fall" Sentiment. I decided to keep this fairly clean and simple. I printed my own pattern paper using the sentiment that I printed in brown and orange to the correct size for a mat and placed on base of orange CS from stash. Embossed the Mat with CB EF Forest Branches for texture. I printed the Pilgrims and colored with Copics and pencils. I cut them out with Nesties Oval Die matted on an orange scallop oval cut with Nesties Die. Attached the image with pop up dots. This was a fun card to make with my own Designer Paper! 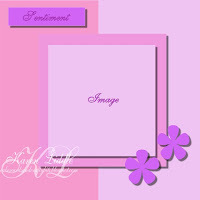 Decided not to add a lot of layers and embellishments to let images shine. Sentimental Sunday: Theme is Thanksgiving with sentiment. Good mornng. I made this card for Annabelle's Say it in Lime Green, Black, and White challenge. I decided to make another Christmas card as I have not made enough as of yet. Using the "Stamped for Christmas" Set from Annabelle, I paper pieced the tree using some lime CS scraps after I stamped it with Memento Tuxedo Black on white CS. I colored in the presents with green pencil and Sakura Clearstar Pen for some shine. 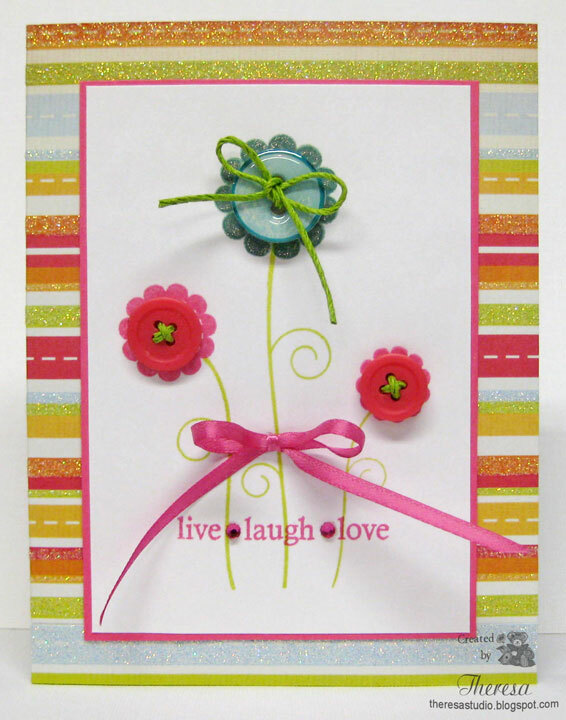 Added lime green Sprinkles also from Annabelle's....love these embellishments. Finished with some embossing with CB EF With Love Borders and the sentiment from the same stamp set. AllSorts Challenge: Use black and white plus one other color. 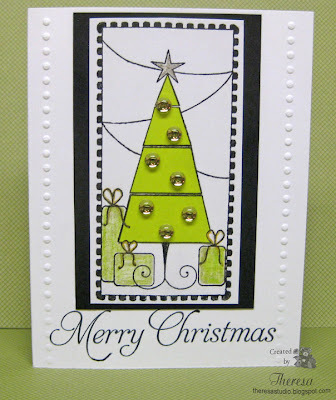 A few weeks ago, I was lucky to win some Digi Doodle images and I am using "Christmas Ornaments", one of my wins, in this card. I colored the branch with copics and the ornaments with Metallic and Glitter Jelli-Ink pens to give some shine and sparkle. ( Hard to see...BIRL) I distressed the edge with Tim Holtz Distress Ink Barn Door. Matted this on BasicGrey Jovial Pattern Paper. My Card base of GKD All Spruced Up was embossed with CB EF Polka dots and and layered partly with another pattern from Jovial Paper Pad. Added branches made with EK Success punch and some Annabelle Red Sprinkles. Sentiment stamp is from a magazine insert from last year that I embossed with Red EP. Stamps Are Us: Our challenge theme is Bling It On. Red sparkles are my bling. Thanks to my friend Patti P for letting me know about Digi Doodle Shop's challenge and images. Must be thinking about snow as I seem to be on a Snowman streak. Love the snowmen but not the snow! 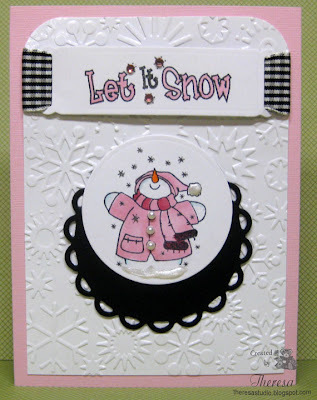 I pulled out one of my fave stamps from Creative Clear Stamps "Let It Snow" and created this card using pale pink, black and white. This fits several challenges. Crazy 4 Challenges: Use at least 3 of each of the following: 3 different papers (yes card stock counts as a paper), 3 embellishments, 3 dies or punches. Not sure if it 3 types or 3 of the same embellishments but covered both ways. Let's Ink It Up: Show your favorite technique. Mine is coloring especially with Copics. Do You Stack Up: Be inspired by a song. The clue to my song is in the sentiment! Sweet Stampin' Challenge: Use gingham on your card. 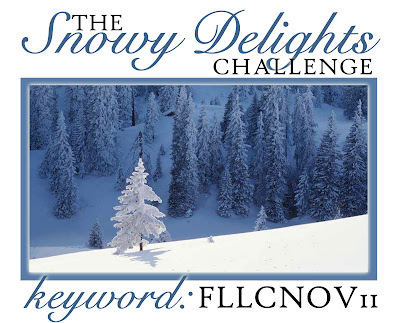 Craft Your Passion: Theme is Let It Snow. Oldie but a Goodie: Theme is let it snow. The snowman stamp is over 2 years old. Stamps: Creative Clear Stamp's "Let It Snow"
Meet Polly who is a new digital image from Sassy Cheryl. I am pleased to say that I named her. You see there was a contest to name her and my entry was chosen. I chose my Mother's name for my entry because she looks like a feisty girl and my Mother is still a feisty girl at the age of 91. I have colored her and her pumpkin up in fall colors for the Sassy Cheryl challenge. Sassy Peggy's challenge theme this week is 'embossing'... any type of embossing that you would like. I have added embossing on the pattern mat with a Cuttlebug EF Polka Dots and also on the pattern border(Doesn't show very well). Also did the sentiment with heat embossing with Versamark and Copper Pearl EP. 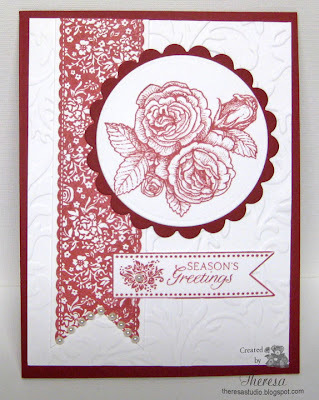 Sassy Cheryl's Challenge: Use embossing. Our Creative Corner Challenge: Create a project using pumpkins or the color pumpkin pie as the focal point or main color of your project! Papers: White, Green CS, Nikki Sivils Patterns "My Friend Bird"
Fab 'n' Funky: It's all white in the night. Use white as your main focal color and one other accent color only. Green is my accent. Prairie Fairy Friday: No black lines. Love how this came out using Memento London Fog ink to stamp the image. Also used for the sentiment. Will be doing this more. 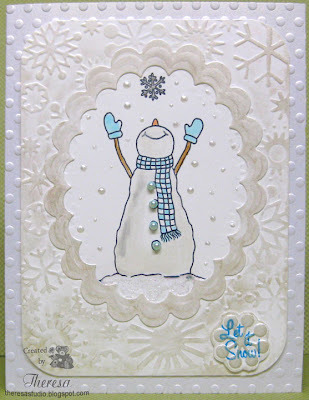 In addition to Flowers and Teddy Bears, another thing I seem to love to use in cards are Snowmen. Mona at Flourishes Timeless Tuesday Challenge ask us to create a card using the Double Embossing technique. 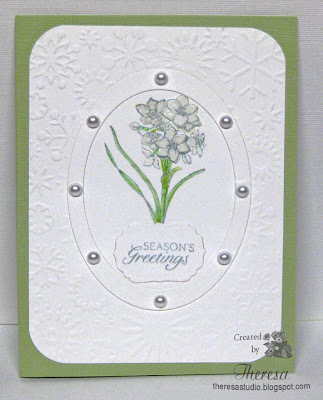 I used Nesties Oval die and CB Snowflakes EF on White CS to emboss my surface leaving a clean space for stamping. 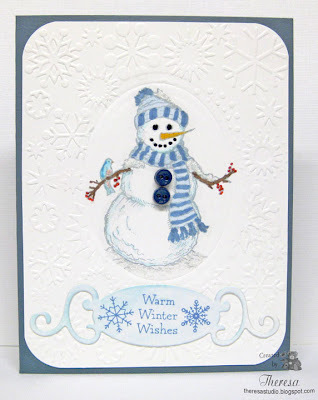 I created my card with Flourishes "Warm Winter Wishes" Snowman stamped with Memento London Fog ink rather than Black ink. This gave a much softer image to color in Copics. Added some Frosted Lace Stickles, buttons, black glaze to the eyes and mouth, and red glaze to berries. Rounded corners with EK Success punch. 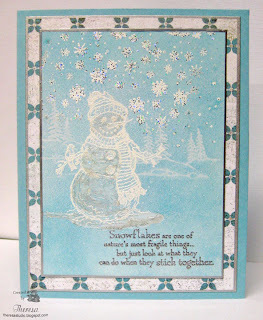 Stamped Sentiment and snowflakes ( from same set as snowman) in SU Blue ink and cut with Spellbinders Fancy Tag die. Timeless Tuesday 143: Use Double embossing technique. 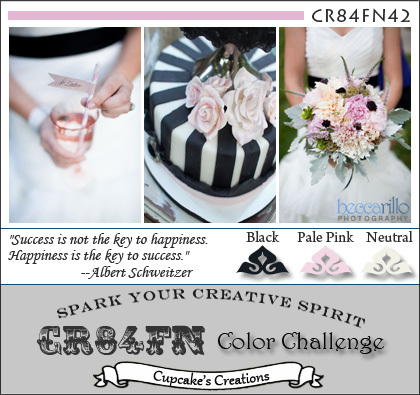 At There's Magic in the Air, this week Audrey challenges us to create a card/project and use "White on White", except the image may have color. The image that I used is Paper Cupcake's "First Snow" which was available for $1 ...hurry if you want as it only available through Sunday, today. 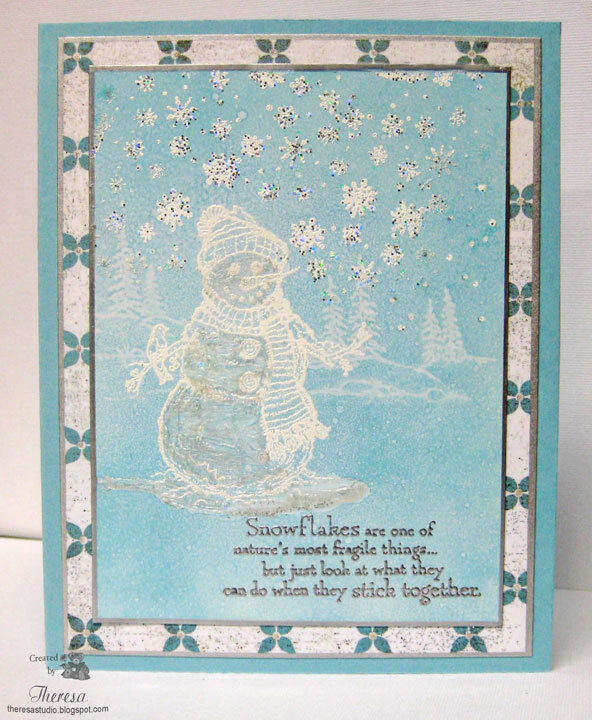 I used a shimmery white CS as the base and printed the image on white CS that I partially embossed around the snowman. I framed the snowman and colored with copics. Added some snow and pearls. Do You Stack Up: Be Inspired by a song. My song is "Let It Snow"
Crafty Catz Weekly Challenge: Use a digital Image. Cards for Men: Theme is It's nearly Christmas. Paper Cupcakes Image "First Snow"
Flourishes Sentiment Stamp "Warm Winter Wishes"
There's a new challenge in cyberland. 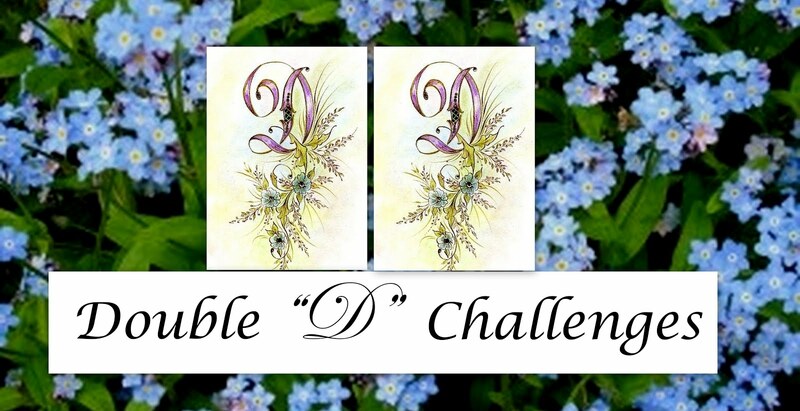 The first weekly challenge is being held at the Cheery Lyn Designs blog. The challenge this week is to Make a Tag. You must use at least one Cheery Lynn Die -one of the rules. Check details here. The winner will be chosen based on merit by Cheery Lynn Designs and will receive a $20 coupon for shopping at the Cheery Lynn website. I sure would like to own more of her wonderful dies so I made a tag to enter. I used the French Pastry Doily that I cut from shiny Red CS and folded around my tag cut from a Sparkly White CS and embossed with snowflakes EF. Used a Flourishes stamp of winter mittens from "Warm Winter Wishes". Finished on the back with "To" and "From" stamps from GKD. This would be a great one to win! 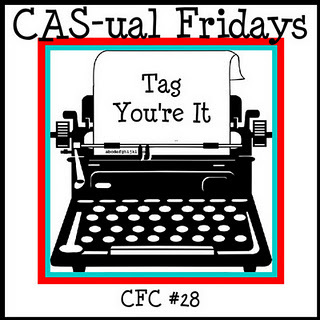 CAS-ual Friday: Make a clean and simple tag. I am back for a third post of a Flourishes Challenge. 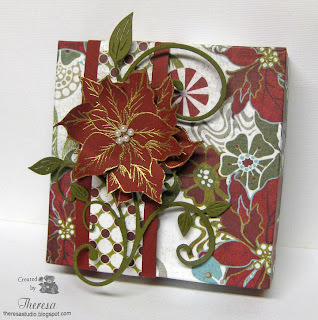 This challenge is to make a card round like a wreath using Flourishes Stamps. I made my round card actually using a wreath stamp from Flourishes "Wreaths for All Seasons". This was, in a way, an experimental card since I never attempted one quite like this.....It kind of turned out looking like a compact so I am calling it a compact card. 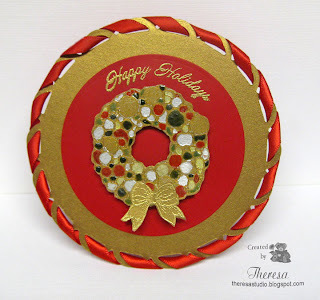 I used the largest Spellbinders Lacey Circle Die to cut the top in Metallic Gold CS. I threaded red ribbon from stash around the edge. Added a circle of red CS cut with nesties Circle Die. 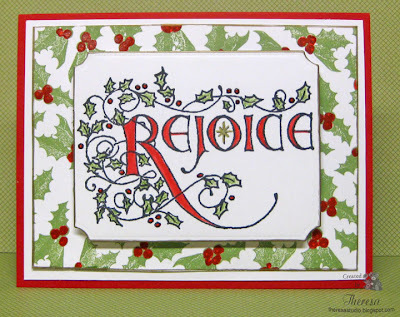 I stamped and embossed a sentiment from "Doves and Holly" set curving the stamp to fit on the edge of the red mat. I stamped the wreath on the Gold CS with versamark and embossed with clear EP. I colored the balls on the wreath with metallic gold and silver markers and red and green glaze pens. This was kind of an iffy technique but it did dry and created a stained glass look. I cut out the wreath and attached with pop up dots. Finished with a bow made with a stamp from the wreath set. For the inside, I cut a folded circle (with a hinge) and attached to the back of circle with image. 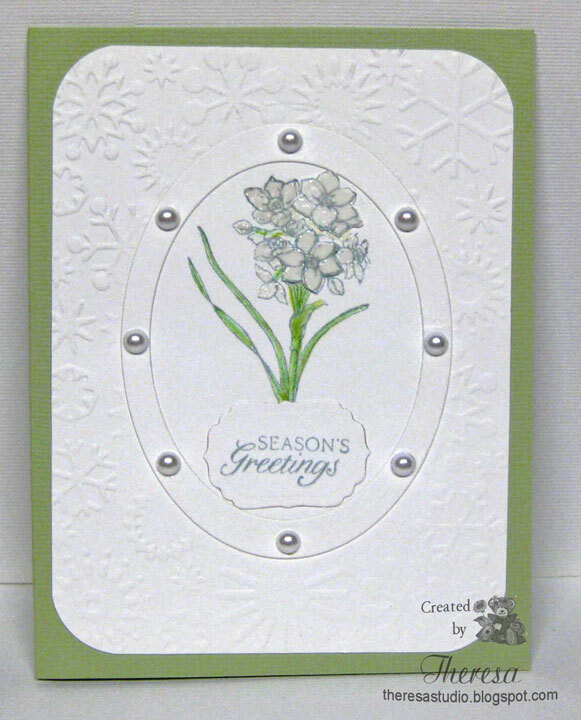 Stamped sentiment inside from "Paperwhites" set. 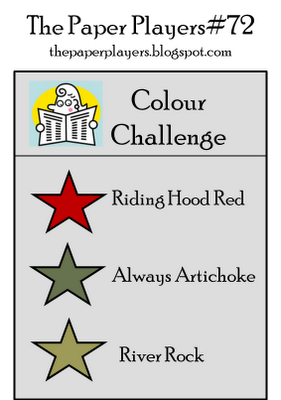 I am back again with a card for the Flourishes second noon time challenge which is a color challenge of red, white, and soft green. Our inspiration is to be the ever-so-tasty cupcake tower shown in the graphic. Remember the winner receives the entire Flourishes November release but be quick as the challenge closes today at 5PM EST. I used the "Holly Background" ( just happened to be on my desk) and stamped it in Memento Bamboo Leaves on GKD White CS and colored the berries with Sakura Glaze Pen. I edged this with Pilot Gold marker and matted on White CS and attached to the base of Red CS. 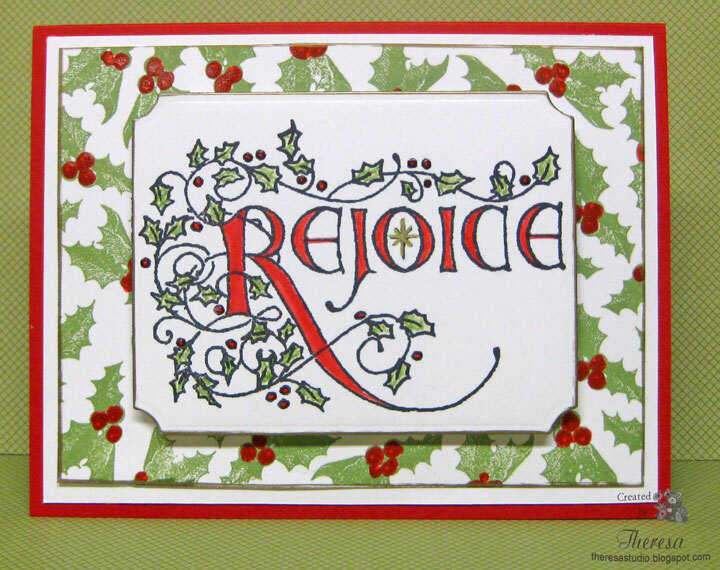 For the focus, I stamped Flourishes "Rejoice" with Memento Tuxedo Black and colored with Memento Lady Bug and Bamboo Leaves Markers. This I cut with Spellbinders Die and edged with the gold marker. Added the red glaze to the berries. I really like the softness of the green ...seems like I usually use a deeper green for Christmas. This is my entry for "Christmas Sweets". 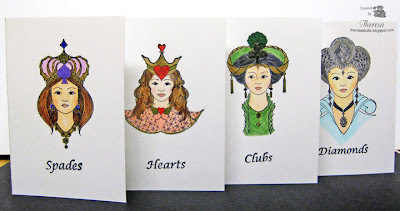 What fun at the Flourishes blog this week during their latest release! 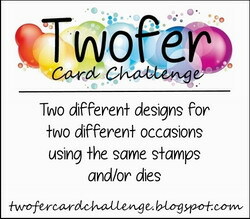 The first of two noon time challenges was to create a tag or use a tag on your card or creation. The deadline to enter is today by 5 PM EST so hurry to enter to win the ENTIRE release for November! For my tag shown on lower left, I used the Flourishes "Holly Background" (won last month) and "Holly and Doves" (also won this one). I stamped the Doves and colored with Copics and cut out and attached with pop up dots on to tag stamped with Holly Background and matted on green paper both cut with Spellbinders Labels 4. Just for Fun: This is another tag that I made with leftovers from cutting out the background. I did it again....I missed the deadline for Annabelle's Stamps challenge and I really like the card that I made for her challenge: to focus on a sentiment. Some day, I will learn not to wait til the last minute. Oh well! There's always another time and more challenges to enter. 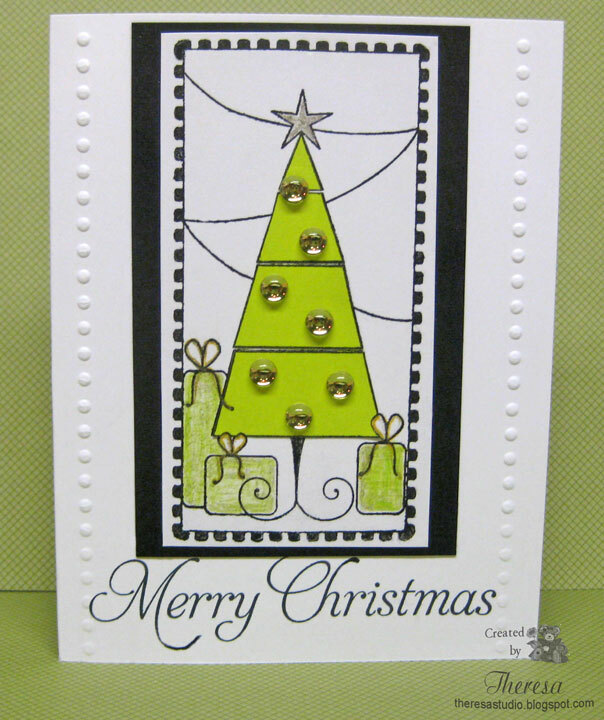 I made this card using a sketch from Sketch Critter Blog so I do have time to enter there. I used Annabelle's stamps from "Stamped for Christmas" which I stamped with Distress Ink Crushed Olive on Ivory CS. I colored ornaments with Copic RV29 and Crushed Olive ink. 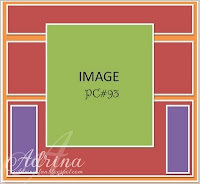 Cut out with circle die and rectangle dies. Used Ivory as base, textured green CS mat, and pattern mats from Authentique Wonder paper pack.Embossed green mat with CB EF Herringbone. Finished with Red Sprinkles from Annabelle. Allsorts Challenge: Anything but square. Scrap-Creations: Show projects where the sentiment is the main focus. My card works for this. 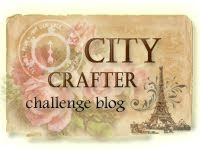 Crafty Catz Weekly Challenge: Anything Goes. 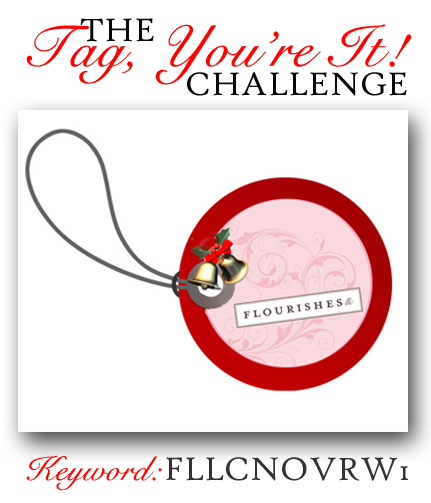 Flourishes is having another release this week which means some fun challenges to win prizes. The Snowy Delights Challenge is to capture some of that snowy sparkle on our cards.We are to use glitter, Flower Soft, or any kind of bling that offers up a snowy feel. The winner will receive all the new releases. 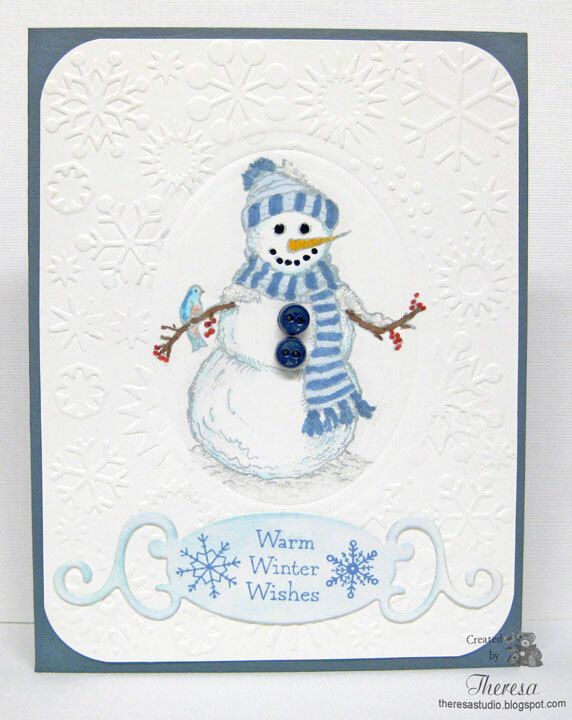 My card features the snowman, snowflakes, and sentiment from Flourishes "Warm Winter Wishes" on a snowy background created with Distress Inks Broken China and Tumbled Glass on White Glossy CS. The Snowman was stamped with Versamark ink and embossed with Ranger White EP. I stamped some snowflakes and embossed them with PSX Snowflake Embossing Tinsel. This really gave a lot of glitter and shine and was hard to capture in the photo. The sentiment was embossed with Zing Silver EP. Edged the image and mat with a Pilot Silver marker. 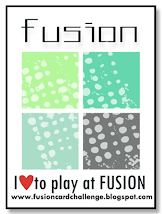 Mat is BasicGrey from Figgy Pudding and base is Teal CS from stash. More glitter added to mat with Sakura Clear Star Pen. Added some stickles on and below snowman. I think I may have overdone the effects on this card.....almost had a blizzard with all the snow! When I made this card, I did not know that it was going to be so hard to capture the colors in a photograph to correctly show in my post. 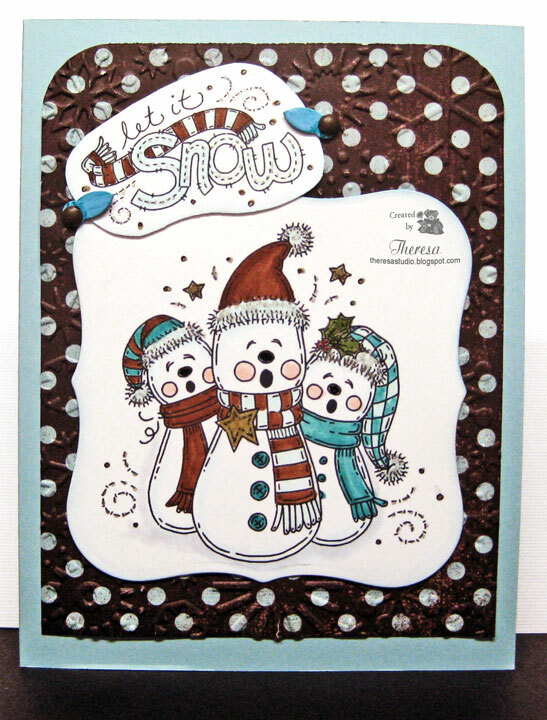 I used non traditional colors of brown and teal for the snowmen but the browns show more as a deep red. 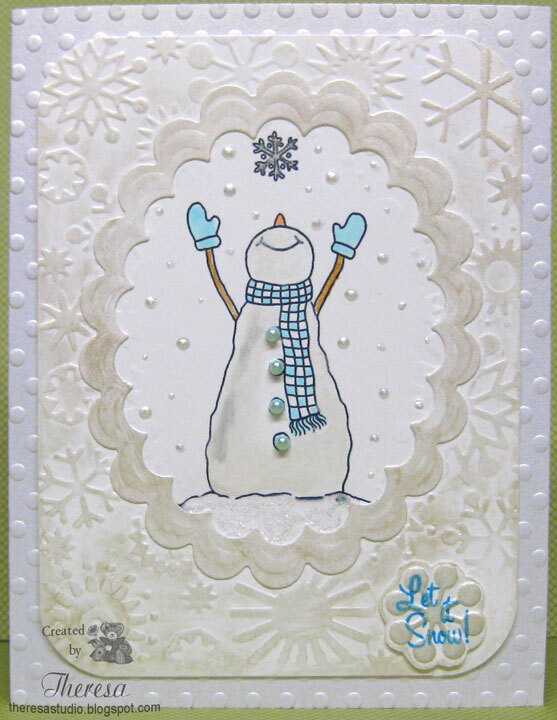 I used 2 images from Meljens Designs - Caroling Snowmen and Let it Snow. I colored the images with Copics and added some glitter with ClearStar Pen and used Black Glaze Pen on the noses. Used brads and photo holders on sentiment that I fancy cut. Meljens Designs: Use brads. Brown ones are holding the sentiment. 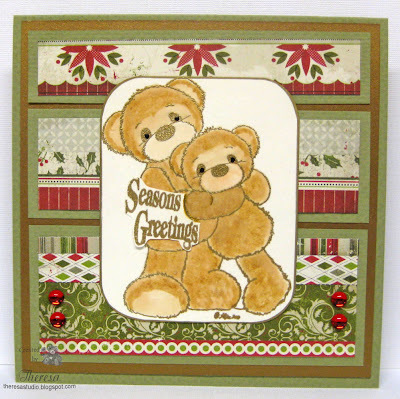 Charisma Cardz: Cutsey Cards...aren't these the cutest Carolers? Digi Doodle Shop's Best: A wintry theme. 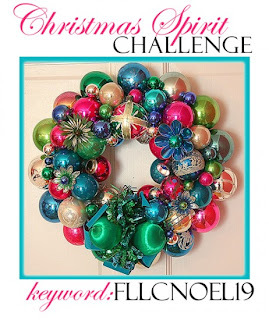 Craftyhazelnut's Christmas Challenge: Bright Colors and Sparkle...there is some sparkle...hope you see it. 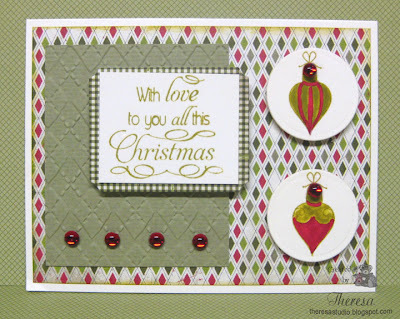 One Stop Craft Challenge: Show 3 things on your card. Happy 3rd Birthday to One Stop. There are 3 snowmen, 3 stars, 3 buttons on the image. Do You Stack Up Challenge: Use some teal on your project. I received a sheet of rubber stamps featuring the Queen of Cards in a blog candy over a year ago but I do not know the make of the stamps. If you know, please let me know. I decided to make some Tally Cards as a gift for for my Mother who loves to play cards and host card parties. I stamped each queen on GKD white CS which I think is a good size for this purpose. I used artistic license for the colors chosen that I colored with Copics, metallic markers, and gel pens. Guess the traditional colors to use would be red, black, and yellow. I will make several of these and design a box to fit 12 in a set. May even try another color theme. Keeping these embellishment free so they can be used for scorekeeping. At C.R.A.F.T., the challenge is Family Games, Board Games, and Activities. I thought my tally cards would be a good entry for this challenge. Hello...back for a second post. I had so much fun making a mini pizza box using Selma's directions found here that I had to make another one. 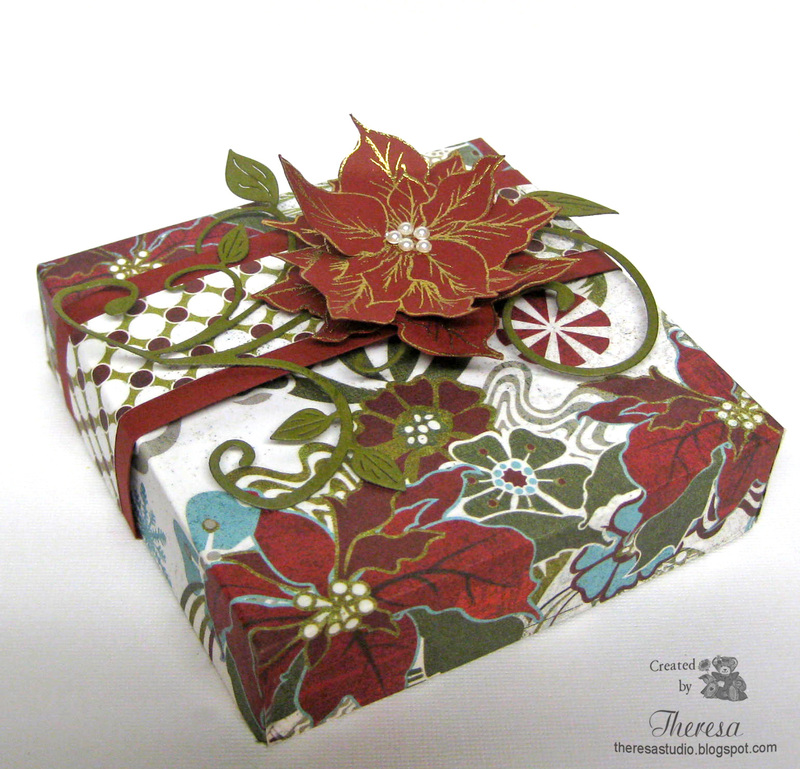 This one is also made with BasicGrey Figgy Pudding papers for the box and band. 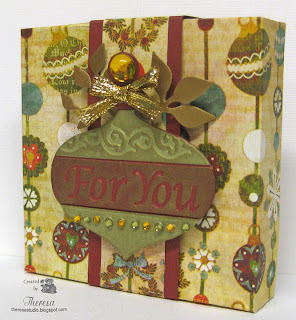 I made the ornament with a Cuttlebug Die and Embossing Folder "For You" from Cranberry Tart and Green CS. Cut some branches from Gold Metallic CS with Sizzix "Branch" Die and attached to back of ornament. Finished with some Gems and Gold Metallic Ribbon Bow. I know I will be making more of these neat boxes. Joan's Gardens: Use Selma's new technique for creating a box, use a band around the box, use Christmas Paper (Graphic 45 if possible), decorate the pull off band. Did have any 12x12 paper from Graphics 45. 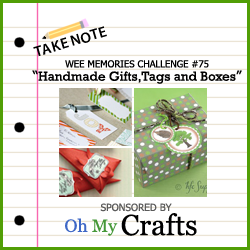 Wee Memories: Challenge is handmade gifts, tags, and boxes. BasicGrey Challenge: Anything Goes. Used paper from Figgy Pudding. I am making this as a special Thanksgiving card for my husband whom I affectionately call "Daddy Bear". The idea of this card has been churning around in my head since I read the challenge at the Scrapping Cottage Blog to create a project using frames and use any Cottage Cutz die. I do not have any frame dies so I had to be creative and use a die to make my own. I used the Cottage Cutz Acorn Embellishment Die and made my frame with leaves and branches cut with the die. I used the frame to highlight the Bear cut with Cottage Cutz Bear Die. Added some Acorns cut with the die. 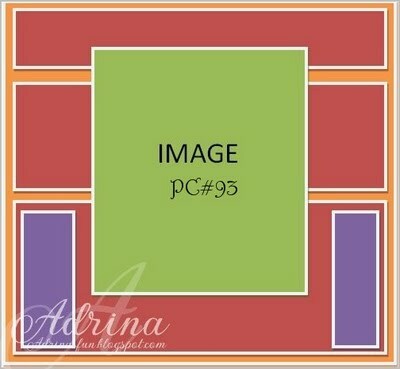 Scrapping Cottage Blog: Create with a frame. Used Cottage Cutz dies mentioned above. Speedy the Cat's Friends Challenge: Fall or winter theme. Fall theme used with Country Thanksgiving Sentiment. Our Creative Corner: Masculine card. Made for my husband. Kaboodle Doodle Challenge: Colors of fall. Bearly-Mine Challenge: One for the Boyz...for my DH. I had fun making this mini pizza box for Joan's Garden challenge. 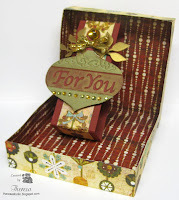 I just love this box that Selma showed us how to make in a tutorial last week. 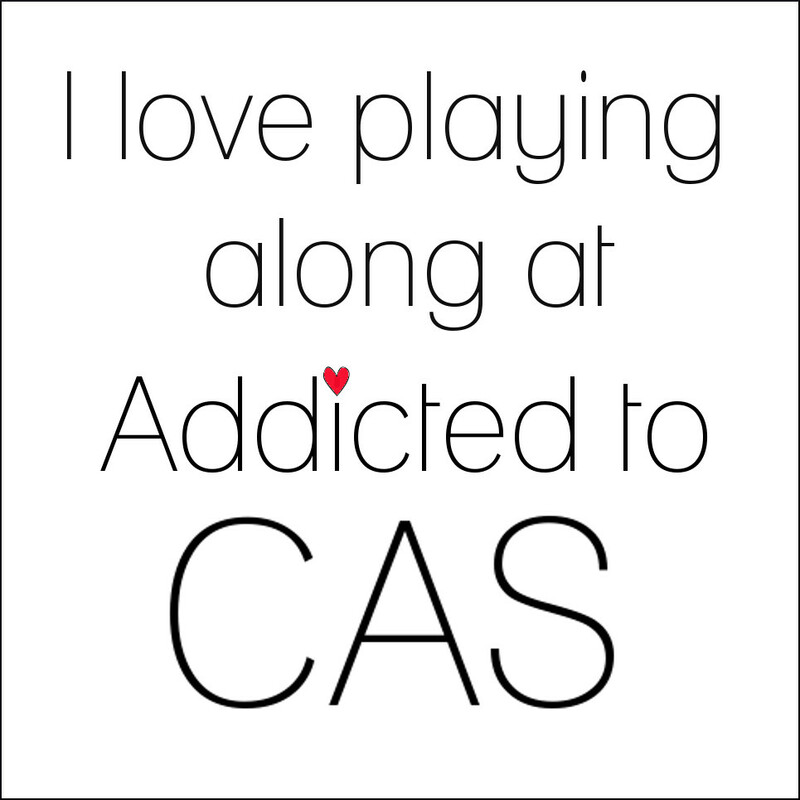 Thanks for sharing this with us, Selma. Check it out at Selma's Stamping Corner here. 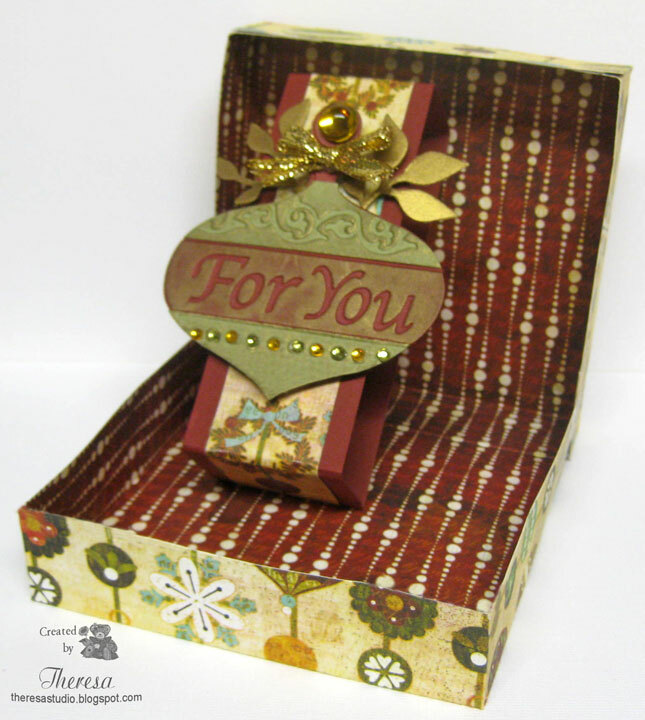 I made this box using Basic Grey Christmas paper from Figgy Pudding. I stamped a GKD Poinsettia stamp from "A Year of Flowers" twice with Versamark and embossed with Gold EP. I cut out the 2 flowers, shaped a bit and stacked with pop up dots. The band was made with a strip of GKD Cranberry Tart layered with a strip of the same paper as the box but reverse side. A Flourish cut with Cheery Lyn Die Fanciful Flourish was layered on the band . The Poinsettia enhanced with pearls on the cyathium was placed on top. This box will qualify for several challenges. 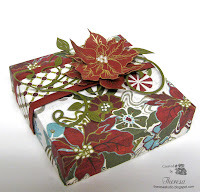 Joan's Garden: Challenge is use Selma's new technique for creating a box, use a band around the box, use Christmas Paper (Graphic 45 if possible),and decorate the pull off band. I did not have Graphics 45 paper but mine is Christmas. Craft Your Passion: Challenge is Bingo. I used the top row - Flowers, Pearls, Use a Punch. Papertake Weekly: Anything goes plus a bit of bling. Used pearls as bling. Bearly Mine: Anything but a card. Cooking It Up With Katie: Ingredients are: A-Anything, B-But, C-a Card. All together the challenge is Anything but a card. Crazy 4 Challenge: Theme is wrap it up! Hello...I'm back! Been missing a few days ....busy doing some minor home improvements and getting ready for winter....raking, bagging leaves etc. I have not been making many cards but I have started making my gift calendars for Christmas. I made this card for our Anniversary last month and never posted it so thought I'd share with you. I used ivory CS that I embossed with a Cuttlebug EF and then distressed with Tim Holtz Antique Linen distress ink. Added some cut outs from Graphic 45 Curtain Call Designer paper. The row of rhinstones is recyled from a dress. 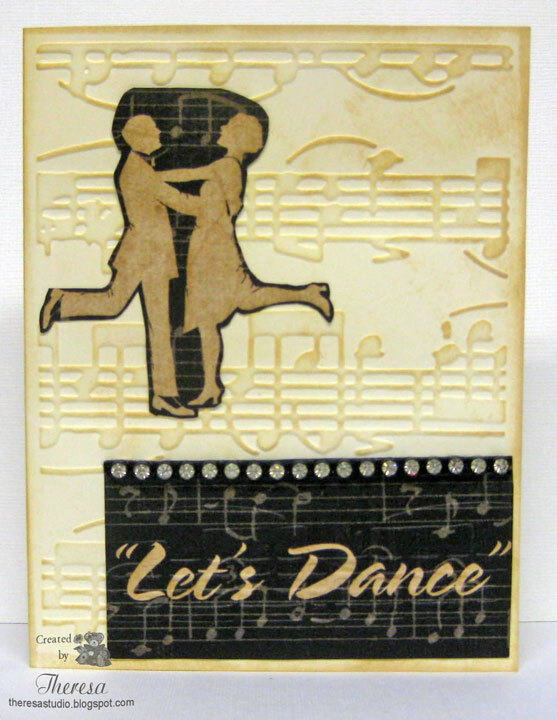 I am entering in a challenge at CRAFTS AND ME with the theme "Let the Music move you". I'll be back later with my entry for Joan's Gardens. Annabelle Stamps challenge this week is a sketch. I changed it a bit but the elements are all here. 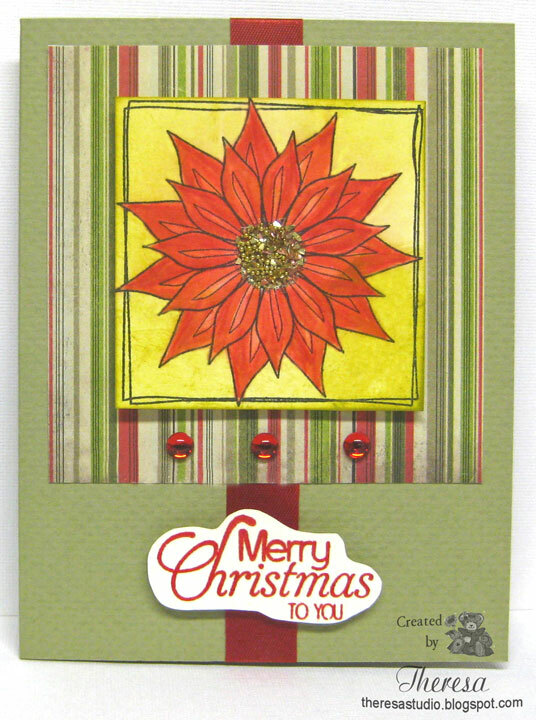 I used the poinsettia from Annabelle's "Squared Posies"I stamped with Memento Tuxedo Black on ivory CS and trimmed. I colored with red Copics....those reds are so hard to color without bleeding when you do not use the right paper. Oh Well!! I sponged the image with Tim Holtz Distress Ink Crushed Olive. Placed on a mat of Authentique Paper from "Wonder" pad. Attached this to a card base of Green Textured CS that I had a Red Satin ribbon wrapped around. 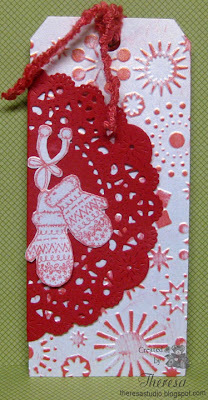 Added a sentiment from Annabelle's "Stamped for Christmas" that I heat embossed with Red EP and cut out freehand. 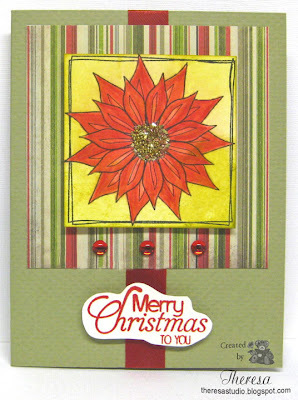 Finished with those lovely Red Sprinkles from Annabelle and used Art Glitter Gala Glitz in the center of flower. Papertake Challenge: Anything goes with bling. Party Time Tuesday: Challenge is to be inspired by Photo shown on right. 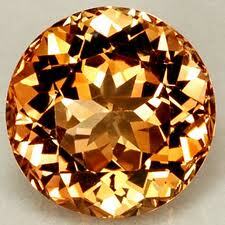 This inspired the use of Gala Glitz. I can not believe it is November and Christmas is fast approaching. I am now turning my thoughts to Christmas cards. I love this stamp of bears hugging and the pattern papers both that I bought at Michelle's Scrapbooking and More Shop at Hartville Market Place but are also available at her online store. ( This is an unsolicted endorsement.) The Pixie Cottage has 2 parts to their challenge and you can choose either or both to play along with. They have a sketch and/or theme that is "Go For Gold" . I decided to combine the 2 using the sketch shown aboveand used gold elements of metallic card stock as a mat on the base card of green cs but that does not show very well. I also gold embossed the image of "You Give the Best Hugs", The Pixie Cottage stamp and the sentiment from Creative Clear Stamps. I used strips of pattern paper from Authentique pad "Wonder". I tried to show the sentiment as if the bear is holding it as a banner.Finished with some Annabelle's Red Sprinkles. You may be able to see the Gold Metallic CS better if you click the photo to enlarge. Simon Says Stamp: Anything goes. Cards for Men: Use an animal on a card. Jingle Belles: Us a creature on a Christmas Card. 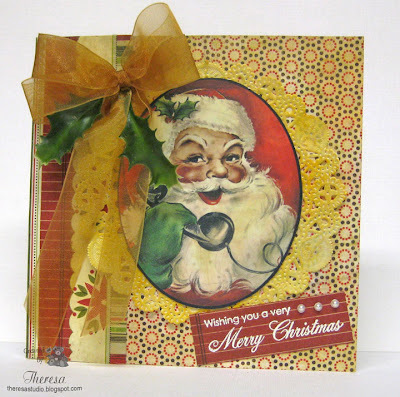 CraftyHazelnut's Christmas Challenge: Make a card for someone special. My husband loves his Teddy Bears and hugs so this card is specially made for him. Papertake Weekly Challenge: Anything goes plus a little bling. The sprinkles are my bling. Time to start preparing cards for Christmas and make a gift list.